Britax / LAP Amber Beacons. 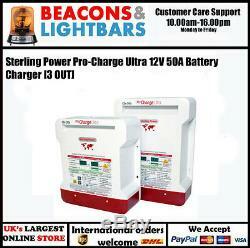 Sterling Power Pro-Charge Ultra 12V 50A Battery Charger PN:PCU1250 [3 OUT]. Sterling Pro-Charge Ultra Battery Charger - The latest in battery chargers with plenty of well thought out useful features. The unit has clear digital displays on the front which show information about the voltage and current supplies. Easy to install & wire up beause of its simple output screw terminals. New features on this product surpassing that of standard battery chargers include: 1 11 pre-programmed battery curves including: Open/Sealed lead acid, AGM, Gel, LiFePO4. 2 1 custom set, can be set from charger, unlike our competitors there is no need for a computer to do this operation, all can be done from the front panel. 3 2 x digital meters for current and voltage measurement and a 32 LED information display. 4 1 x power meter to show what reserve power left in the unit. 5 PFC, active, up to 0.99 PF, ensuring efficient power conversion, up to almost 90% as opposed to about 60% for older, non-PFC technology. 6 % power reduction to allow unit to work with restricted power available (available on local control or remote control panel). 7 De-sulphation auto cycle built in to software. 8 New, low activity, standby mode to increase battery life. 9 Battery health program every 7-10 days. 10 Multiple speed fan control. This reduces unnecessary fan noise experienced by the customer, even though the new extreme efficiency reduces the need for fans. At high ambient temperatures (40-50 deg C), however, fans would still be required to ensure operation. 11 Primary (processor digitally controlled) and an emergency backup secondary (analogue controlled) high voltage trip. 12 32 LED information panel to ensure maximum information transmitted to owner. 13 Internal scan and systems check to ensure product is okay. 15 Small footprint and light weight. 16 Include battery temperature sensor to give temperature compensation and high temp trip. 17 As with all our marine chargers all metals used are non-ferrous or heavily protected, so no corrosion. 18 New synchronised rectification output as opposed to diode output, giving up to an extra 9% efficiency. 19 Conforms to ABYC drip test, is waterproof from water directly dropped on to the top of the unit (+/ - 17 deg) if installed correctly (vertically). 20 Thermostatically controlled force draft cooling. 21 The printed circuit boards are conformal coated for high humidity and salt air operations. What size of charger do I need? Most companies recommend a battery charger to be about 10% of the amp hr capacity of the batteries requiring to be charged. However, if you have a generator set onboard and you wish to charge your batteries faster - ie, to save fuel, then depending on your budget, you can easily double the charger size to reduce your generator running hours and achieve the charge faster. Power Factor Correction Power efficiency of the Pro Charge Ultra is significantly higher than its predecessors. The PCU runs at >90% efficiency and the power factor is rated at 0.99PFC this is in contrast to a non-PFC charger which runs at approximately 65% efficiency. Other major benefits of PFC allows the unit to run off a dirty / modified / quasi sine wave from a generator (example). The other advantage of this technique is less heat is liberated during operation, therefore reduced use of fan. 11 preset charging algorithms & 1 custom set The Pro Charge Ultra has 11 different charging characteristics for corresponding types of batteries: Gel, AGM, sealed, open, calcium, LiFePO4. If these should not suffice there is 1 customizable setting which the user can set themselves - simply enter the absorption and float voltages then press enter and the settings save. Performance monitoring LED bar A bar of LEDs display the percentage to which the Pro Charge Ultra battery charger is operating at. This is easily and quickly recognised at a glance and can be easily analysed. Redundant high voltage protection device In the event of a failure of the main processor this unit provides another safety system to shut off the device. Doubling the levels of security. Programmable power reduction The Pro Charge Ultra can also charge with variable performance levels. The following performance levels available are: 100%, 75%, 50% & 25%. This can be controlled via the front panel or via programming the remote control. Power reduction is often used if the power supply to the charger is inadequate e. Small generator but still enables competent levels of battery charging. Another benefit of power reduction is to reduce fan noise, as less heat is liberated. Small, lightweight and powerful The Pro Charge Ultra series is characterised by its very compact, low weight and small footprint structure. The 12V / 60A model only weighs. After your final calculations are made, if you require a larger charger, then the Sterling range, because they are digital chargers can be added together. For larger requirements simply add units (2-3-4 etc) together to meet your requirements. Multiple smaller units can offer some advantages over 1 larger unit: They tend to be lower cost, have a built in redundancy, (in event of one failing) and enables you to switch one off in the event of low shore power facility. Synchronized Rectification Modern, synchronized rectification with MOSFET technology makes the Pro Charge Ultra Series 9% more effective. Less heat liberated and increased efficiency are also features of this latest technology. Boasting an elegant yet functional design. The Pro Charge Ultra housing was designed by a renowned American product designer. In the foreground stands optimal function and clean lines. The housing is made of plastic and the back is made of well protected metal plate with the latest corrosion coatings, all other metal fixtures and fittings are stainless steel or non ferrous. Automatic Desulphation / Equalization Every 7-10 days the Pro Charge Ultra undertakes a desulphation / equalisation and anti-stratification program which keeps your batteries young and rejuvenated. 32 LED display 32 LEDs built in to the front panel provides all the necessary information about the charger including: charging status, battery chemistry select, temperature and voltage warnings along with many others. Variable fan speed The internal temperature of the device ultimately runs the speed of the fan. This guarantees a minimum possible noise. So called thermostatically controlled force draft cooling. Three isolated charge outputs (PCU 12V/10A has 2 outputs) The Pro Charge Ultra has 3 isolated charging outputs. 3 batteries or battery banks can charge without the batteries themselves being interconnected, e. Starter, domestic and generator starter battery. Voltage + Current LED display 2 LED matrix displays. The left matrix displays the voltage output from the charger and the right matrix displays the current leaving the charger. Global Application The Pro Charge Ultra will operate with AC voltages ranging from 80V-270VAC (40- 70Hz) a. Credit/ Debit cards taken ­ please call our information line on 01214713388. Personal Cheque ­ goods will only be despatched once the cheque has cleared. VAT will be charged at our current local rate. That your companies VAT registration number is showing and correct on the Europa website: Link Check EU VAT registration numbers on the Europa website. Or call our Sales team on +44 121 471 3388 with your requirements, having your full VAT to hand. We are authorised UK distributors for Britax PMG, Delta Design, Lucas, Vision Alert and Sterling Power, specialising emergency lighting, Amber beacons, lightbars, Flashing LEDS and power inverters , for Advice please call beaconsandlightbars 01214713388. Company Information UK Birmingham based company. Prices include VAT and VAT invoices are given automatically. Orders taken before 16.30 hrs. Will normally be despatched the same day. Company Postal address: Fonejunkie Ltd t/as beaconsandlightbars FJ House 790 pershore rd Birmingham B29 7NG VAT no: 747984076 Company Reg: 5325847 Information Tel: 01214713388. Please call our customer service line before returning an item. The item "Sterling Power Pro-Charge Ultra 12V 50A Battery Charger PNPCU1250 3 OUT" is in sale since Tuesday, June 7, 2016. This item is in the category "Vehicle Parts & Accessories\Boats Parts & Accessories\Other Boat & Watercraft Parts". The seller is "beacon-and-lightbars" and is located in Birmingham. This item can be shipped to all countries in Europe.